So mr. Wells was told it didn’t exist. Evidently ms. Smith didn’t have one. mr. Trent’s firm has one and they still had some cases. ms. Smith’s has some. MML has some. But she did not have a full list and mr. Wells was told she did not have one and Ethics supports that so WTH is the problem? We just waisted $$$$ because someone got a feeling hurt! What part did he not understanding ? No No list was available at the time. Believe the same mr. Wells filed another one about a quorum at a beach restaurant. Again nothing found. False information was given on the complaint and nothing. Every meeting your mr. Trent called for executive session to discuss pending/possible litigation and we are told he would go over his entire list. According to Ethics now days this is not acceptable. He also let them go in executive session on contract personnel and personnel which council can not do with the exception of their 2 employees. things do not get added or she leaves things out. We have all seen this and heard about this. We just seen the Cure development go through this. That’s what I would like to see how much the BS complaints to Ethics cost our city. So now I wonder, Is this just a personal attack on ms. Smith and her family. Is there bad blood between the 2? Because previous attorney allowed the same and he is😇 according to some that is bashing ms. Smith. Will dig into this and let you know if I find anything. Know just the right person for the job. And again Doug I do hope they learned. Sorry you miss the entire point of the Mississippi Public Records Act, which is for the benefit of citizens to have easy and timely access to public records as intended by the Miss. legislature. As I read Mr. Wells complaint, and the Ethics Commission Preliminary Recommendations, their ruling against the city is legitimate in that he was told “no list existed.” Are you prepared to say that an attorney would take the position of representing a public body and not have document listing the litigations she is going to have to address on their behalf, and that I feel certain an attorney the caliber of Trent Favre would have left in a file for access, not to mention the City Clerk, keeper of all city documents, would also have. I understand the Mayor was able to produce this in less than 2 hours as opposed to Mrs. Smith’s 3 weeks. When Trent Favre was city attorney, I distinctly remember him giving his Attorney reports and referring to the Litigation List, and informing the Council that it was hefty for a city their size–26 cases to litigate when he took over from files left by Don Rafferty. Looks like Mr. Wells made a simple enough request for an update of the cases he, as a taxpayer, was funding. Ms. Smith appears to have been stalling for whatever reason, and that is why Ethics ruled in Wells favor. Go read the Mississippi Public Records Act and become enlightened. You may not be so critical afterward. Mrs. Smith is compensated by Wells and the rest of the taxpayers of Bay St. Louis to comply with issues like this. It is part of her job as City Attorney, and the Public Records Act is not complicated to follow. By the way, it was most inappropriate, in my opinion, for her to have assisted Councilman Smith in writing his email to Council which was found to be in violation of the Open Meetings Act. A good attorney knows how to guide a public official as to the legal and appropriate execution of their duties to the public they serve. I see other attorneys do it all the time. Your attack on a citizen because they asked a public official to do her job is typical of politicians. If you are worried about the cost of all of this to the city, it would not be so offensive if the city weren’t being given bad advice. No one minds paying for good advice, but lawyers charge for advice whether it is good or not, and Butler-Snow apparently is no exception. That’s the whole point. Trent kept the Council from getting itself in trouble several times. That was the biggest difference between him and his predecessor. This did not mean Slabbed did not have some dust ups with Trent – we did not always see eye to eye but I respected the fact he was representing his client first and foremost. I’ve watched several council meetings and I do not see the same high level of representation. Ms. Smith reminds me far more of Mr. Rafferty than her predecessor the only difference between them being that Raff is a gifted criminal defense lawyer that has a ton of courtroom experience. I do not know where David Wells and Smith got cross ways but they did. The difference between Wells and Smith is one is tasked with being the professional in the room. At the end of the day the Council should be smart enough to want an attorney to keep them on the straight and narrow. This isn’t about personalities but if the Administration wants to circle the wagons and double down, I’d expect more of this kind of stuff to happen, just like it did when Raff was City Attorney. You say Trent has a list and didn’t give to the public! Should have been in the minutes? Went in executive session to discuss! Go back and listen to the tapes of these meetings with mr. Trent. But all litigation was discussed according to you! Same reason they went in this time! What is the difference? New Sherrif hearing the complaints? I make a few meetings through out the state and every entity uses this same reason to enter executive session for litigation to discuss lawsuits! Mr. Thorpe’s case was all denied except for 1 thing, a email. One replied the other sent! Ethics confirmed no list was available for mr. Wells and he was told no list was available at the time and ethics stated you do not have to create something for a request! But denial should be in writing! Make sure you reply in writing for requests in 7 days. A slap and learn from your mistakes! No fines, no impeachment’s, no firings and no death penalty as some would like or let’s just crucify them all. Boudin Farve and Falgout was the main targets. Agree this was BS just as well and it was also personal. Not sure what the problem with the school board appointment is about? He picked who he wanted and had good reason for his pick. Volunteers or no different than employees when they put the city in jeopardy. Again you can not go tell the public to go check a house out and you can have it. She was way out of control. Agree Stay Calm and support not hate on them. I see no secrecy with this bunch, not even when they go into executive session. I still am thinking this is a more personal attack on ms. Smith and family or Butler Snow or Both. Always enjoy even though we may not agree on everything. 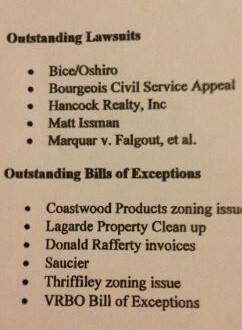 I just posted that I made a Public Records Request for the litigation list Trent referenced when he was City Attorney, and he put it together for me in less than a week. The current city attorney claimed it didn’t exist and any other excuse she could make up, then the Mayor provided it to Mr. Wells within hours. Those, Stone, are the facts. Stone agree with most of your assertions. I said Trent gave out list but won’t talk publicly about. All I’m sayin is just say it do it lay it out in public and stop Ethics Train. We know nothing about going in someone’s house, just say it, vote and work on important stuff, not bs. How is this a personal attack on the City Attorney and her family? I don’t care what the City Attorney’s name is or who they are. I challenge you, Stone, to name me one person in The Hancock County Alliance for Good Government who has launched a personal attack on the City Attorney’s family. I want the details too. I utilized the services of a legitimate state agency to look into what I considered a violation of the state Open Meetings Law. These elected officials take oaths to uphold the laws of this state, not to operate in a clandestine manner. The Ethics Commission agreed. If you and the family have a problem with that, call Ethics yourself. This is typical of a politician, when someone challenges them, they get the vapors and claim we are attacking them personally. Grow up. Not taking up for anyone but our legislature passes bills with firm deadlines for all other entities in the state to provide information requested by the public in a short time period but exempts themselves from having to divulge any information from themselves at all. One again, spend a little time around Jackson and see what really goes on in this state. Maybe this will help clear things up. When Trent took over as City attorney, as I said, he advised Council they had a long ” litigation list” for a City their size. He wanted to start cleaning it up. So, I went through City Clerk and made a Public Records Request for the list. Within a week, I was called to pick up what Trent had sent them. No pain no strain. So, when David Wells asked for an updated list a year later, he never imagined the hassle. And that is when he engaged the assistance of the Mayor, and filed with Ethics. Citizens don’t have to accept being ignored either on any level, from Jackson on down. The Clerk was smart enough to keep her notes too in the process in her efforts to satisfy Wells’ request. Well than I feel sorry for you now Doug. I heard your name from time to time while I was up there but can’t place from whom. May have been from the accounting firm from Hattiesburg that performed my single year audits. Nothing bad, just heard your name. I am friendly with 3 firms from Hattiesburg/Laurel. There are some high quality CPAs up in the Pine Belt and we refer each other regularly. I got out of doing Single Audits. There are a few firms that do excellent work but most view Single Audit/Yellow book engagements as off season busy work. It is hard to make $$$ when the competition is bidding hourly rates that are less than the local plumber charges to keep their people busy and then skimp on the audit procedures to make up the difference. But don’t feel bad for me. If I’m headed to Jackson it is at 100% of my regular hourly rate, which makes the drive worth it. I’d love to catch up with you. Our group from St Clare has done pretty well for ourselves overall. Doug-I now live on the coast and would probably enjoy meeting with you one day. I have had the opportunity to be employed by some entities at interesting times. Remember when someone requests something that it is on the backs of the tax payer to pay it. Be judicious and fair on what you want. If they gave to engage contracted specialist we all pay so let’s make it count. City attorney is on the payroll while representing all ethics charges. Taxpayers money could be spent better for sure! Whether the exact and proper procedure was followed or not the result was good. Miss Anderson was removed because she cannot separate her personal thoughts and wants from what is best for the community. Not should anyone get on a City Council to push their own agenda. That works both ways, and yes, it does matter that the legal procedure is followed. If a public official breaks the law for one thing and gets away with it, there’s no incentive to do right the next time. Laws are for the benefit of all, not some. People should also not run for public office to push for their personal agendas either. Like the Ethics Commission said, if Smith wanted to discuss HPC, he should have sent his email to the entire Council or to the Council President to request it be put on the agenda. If you are going to take an Oath of Office to serve, abide by it. That’s why we have rules of procedure for public policy. So everyone’s personal agendas don’t take precedence over the public’s right to know. It’s the public they serve, and the public that pays for everything they do. I’ll toss this out there as nothing more than an observation: well-prepared and knowledgeable attorneys do not attempt to play childish games. They will provide proper answers to appropriate requests and not waste everyone’s time, trouble and money fighting over reasonable discovery requests. Likewise, a competent advocate will act similarly, or more accurately, both will simply behave like professional advocates. Pissants and weaklings get mired in semantic tarbabies, quibbling over nonsense rather than identifying the facts in reasonable dispute and advocating an arguable and reasonably viable theory of law as appropriate and ethical to advance their clients’ position. As presented, this does not speak well for Ms. Smith. To refuse to provide what turned out to be a very short bulletpoint list of a handful of suits and other claims and create problems for the client or themselves where none would have existed evidences a lack of, well, let’s just say something (and, it is a list that competent attorney would maintain, regardless of a statutory requirement imposed upon a particular client). See the whole Bomgar v. John Dowdy/DPS/Fisher nonsense currently playing out in Jackson over Joel’s info request of that which would seem to be a “gimme.” Mississippi has not been a bastion of legal scholarship, competence or education in recent times, but it seems to be getting all the worse, as impossible as that may seem. I’m not shocked by any of it, just saddened by it all. Previous Previous post: Quote of the day….really the century. Thanks Nowdy.